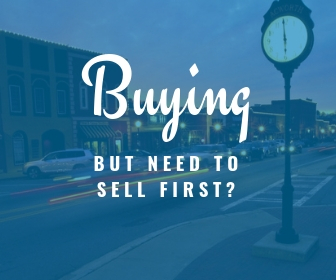 At most real estate brokerages, each agent works for themselves. 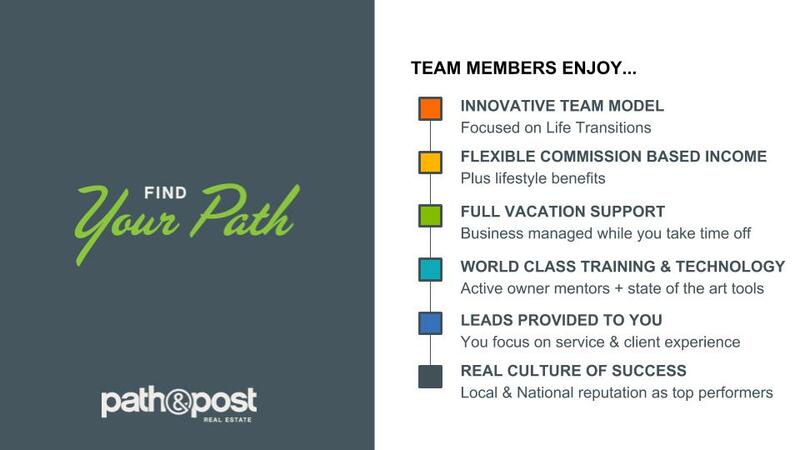 At Path & Post, all of us work together for the client. We hire and train Specialists, not generalists. The average local agent does 3.7 transactions per year, while Path & Post team members average 20+ transactions per year. Our team members develop specific expertise by focusing on critical areas of a real estate transition. Too many agents try to be all things to all people, and we feel it’s the client who suffers. A specialist approach allows us to serve our clients’ buying and selling goals without compromising our service level. Best of all, the collective knowledge, wisdom, and experience of our team gives a depth of expertise a solo agent can’t provide. Is this the path for you? 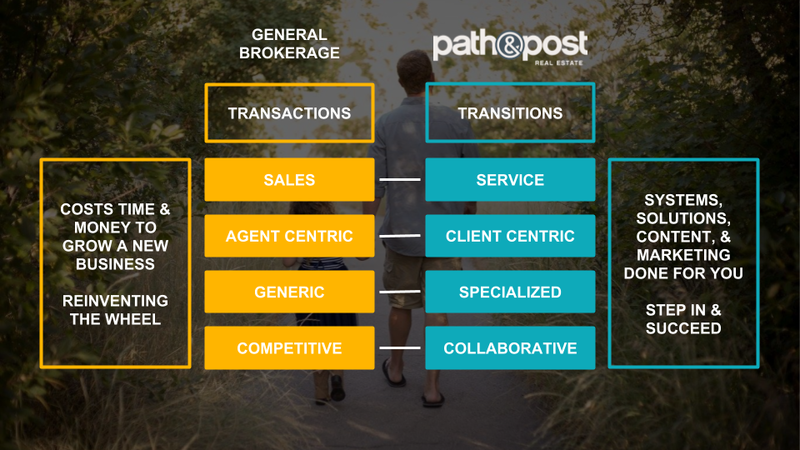 We created Path & Post to help guide our clients through one of the biggest and most emotional transitions in life – buying and selling their home. Our goal is to learn our clients’ unique situation and apply relevant insights to deliver custom solutions. Of course our experience and expertise help us deliver this value to each client, but none of it would matter if we didn’t anchor our efforts to core values. We seek to understand our clients’ unique stories. We want to know their hopes, fears and dreams. Path & Post is here to help them along their paths, guiding and supporting them. We are like the post at the beginning of a trailhead, pointing clients in the right direction and explaining the obstacles ahead. Like any reliable guide, Path & Post walks with its clients along every step of their journey. What makes Path & Post unique? Interested in next steps along the path? We are seeking to hire a dynamic and energetic Specialists. If you are interested in joining our team, please contact us with questions or complete the application. The best candidates share personal and professional goals as well as what they are passionate about in life while completing the motivation field.